Location of the Muscle (active muscles have more connective tissue). Maturity of the carcass (older animals have more connective tissue). 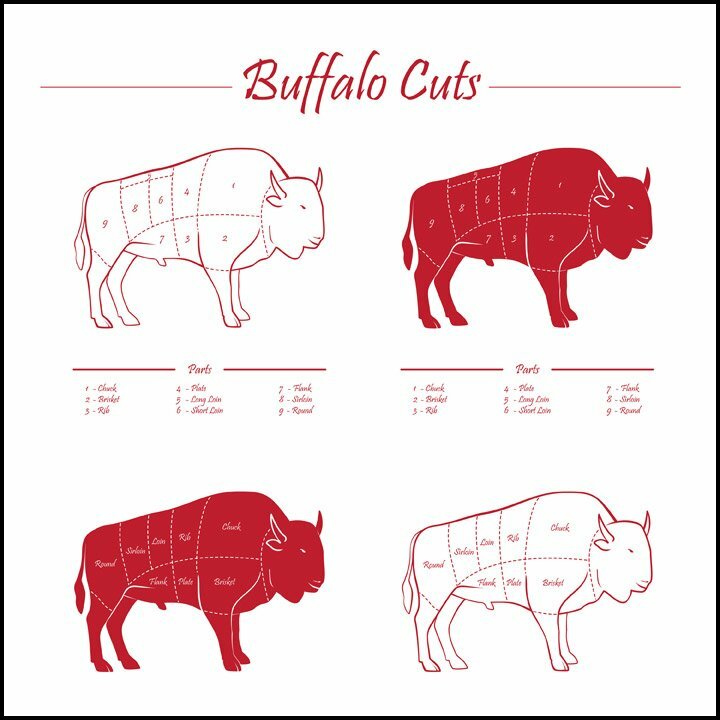 Match the correct method of cooking to inherent tenderness, and you will have tender bison every time. Bison meat is lower in fat and higher in moisture than its cousin beef.This means bison will cook more quickly than beef. Since bison muscle has no marbling, do not cook steaks & roasts past medium done stage. Rub desired seasonings onto bison surface. Place roast fat side up on rack so roast doesn’t sit in juice while cooking. Do not add liquid. Roast at 120ºC (250ºF) – 135ºC (275ºF). Let stands for 20-30 minutes before carving. Season as desired but do not salt. Cook to desired doneness, very rare 55ºC (130ºF) to medium 70ºC (160ºF). Thinner steaks can be pan-broiled 2-3 minutes per side. Cook ground bison to medium well 73ºC (165ºF) or until brown in center and juices run clear. Brown roast at 260ºC (500ºF) for 30 minutes to sear for color and flavor. Reduce heat to 140ºC (275ºF) add 250-500 ml (1-2 cups) liquid to pan. Cover pan or cover roast with foil. Cook to medium rare 63ºC (145ºF) or no more than medium 70ºC (160ºF). Slice roast at right angles to the grain, or with thin roasts, cut diagonally across the grain. For cooking steaks marinate for 6 to 8 hours or needle to tenderize. Alternative: thinly slice partially frozen steaks across the grain and marinate 6 to 8 hours for use in stir fry /satay. Cook to doneness of rare 60ºC (140ºF) to medium 70ºC (160ºF). Season cubes/roasts as desired and brown/sear for colour and flavour. Add liquid to cover and cook at 120°C (250°F) to 160o C (325°F) until fork goes into meat easily. Add more liquid if necessary during the cooking period.